Rockford, Ill. – Partnering with The Autism Program at Easter Seals for the fourth straight season, the Rockford IceHogs announced on Tuesday that the club’s Autism Awareness Night on Mar. 6 raised $22,934. A check will be presented to The Autism Program at Easter Seals during the IceHogs game on Saturday, April 2 against the Iowa Wild. This year’s initiative was formed by the IceHogs and the wives and girlfriends of the players and coaches. The IceHogs wives and girlfriends sold “mystery pucks,” which were each signed by an IceHogs or Chicago Blackhawks player, and also arranged players’ favorite baskets. 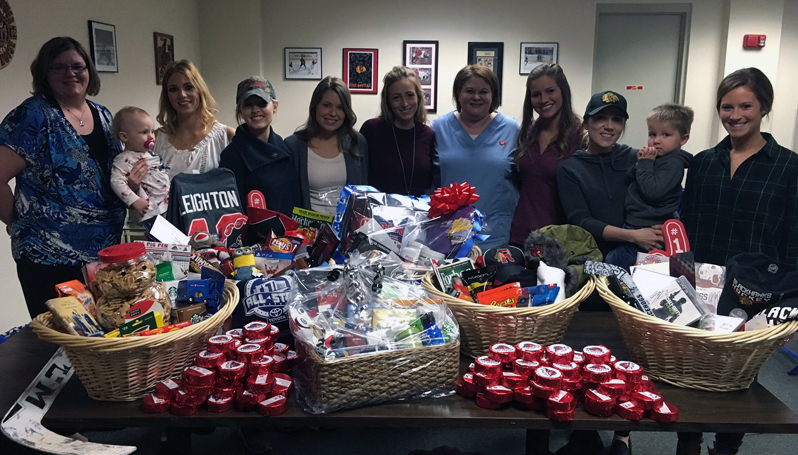 The baskets, which were customized and filled with a variety of items that reflected the personalities and interests of each IceHogs player, were auctioned off during the game on March 6. The donation comes as a result of several different activities from Autism Awareness Night, including a ticket fundraiser, mystery pucks, and players’ favorite baskets. The event was also supported in part by LawnCare by Walter. The donation raises the four-year total to over $65,000 after the IceHogs gave a $40,000 gift to The Autism Program at Easter Seals as a result of last season’s jersey auction. Over the past 17 seasons, the IceHogs Charitable Foundation has contributed to over $1,000,000 to various Rockford area charities. The Autism Program is an inclusive and trusted resource for evidence-based information on Autism Spectrum Disorder and referral services across the lifespan. The Autism Program in Rockford provides screenings, diagnostics, consultations and trainings. As of July 1, 2015, Illinois legislators have not passed a budget and the program was left without a contract or funding from the State of Illinois due to the statewide budget crisis. The IceHogs also graciously donated $40,000 to The Autism Program at Easter Seals in Rockford last season from the proceeds from the IceHogs Autism Awareness jersey auction in 2015. Easter Seals paves the way for programs offering guidance and support, inspiring action and unlocking the potential of each person served. Today and every day, Easter Seals works in our local communities so children and adults can live, learn, work and play in the community. Easter Seals serves more than 38,000 children, adults and families through comprehensive autism and child development programs and services in Rockford and Chicagoland. Autism Spectrum Disorder (ASD) affects 1 in 68 children. It is a life-long disorder with no known cause or cure, nor a known singular effective treatment, although ASD is treatable. People with autism spectrum disorder, at any age, can make significant progress through therapy and treatments, and can lead meaningful and productive lives. Challenges in the areas of communication/socialization and restricted/repetitive behaviors are typical of individuals with an autism spectrum disorder.